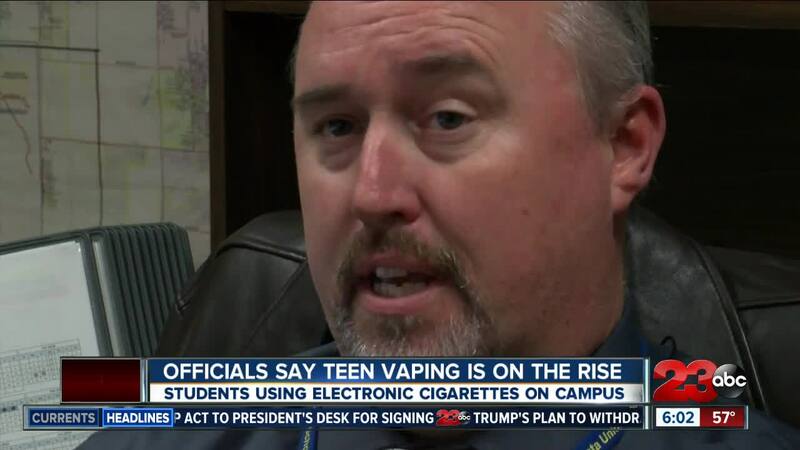 Officials say teen vaping is on the rise and is now considered on epidemic among the youth. Schools are pushing back on the issue, hoping to stop students from using e-cigarettes on campus. BAKERSFIELD, CA. — The U.S. Surgeon General declared 'vaping' an epidemic Tuesday. Research shows that the use of e-cigarettes among younger children is gaining popularity. Brynn Carrigan, with Kern County Public Health, said the issue of teen vaping is prevalent here locally. "It is bad, we have had instances here in Kern County where vaping was occurring in schools, even as young as elementary schools where vaping products were being brought to school," Carrigan said. Todd Price, Vice Principal at Warren Junior High School, said students have tried to smoke e-cigarettes in classrooms, bathrooms and outside on campus. Many types of e-cigarettes are small and easily concealable. One of the most popular vaping products is the Juul, which looks exactly like the flash drive. Officials said e-cigarettes have the same harmful chemicals that are found in other tabacco products and parents should educate their children on the dangers. "Parents need to know what these products are and check their children's backpacks and see if their children have access," said Carrigan.